Battle of Verdun: The third German offensive at Verdun strikes both sides of the salient. The battle was fought between the German and French armies between February 21 and 19 December 1916 around Verdun-sur-Meuse in northeast France. It resulted in more than a quarter of a million deaths and about half a million wounded. It was the longest battle of World War I, and the second bloodiest after the Battle of the Somme (1916). Today, at dawn, our armies began a great battle, which, if Fate has any kindness for the world, may be the beginning of the last great battles of the war. Our troops attacked on a wide front between Lens and St. Quentin, including the Vimy Ridge, that great, grim hill which dominates the plain of Douai and the coalfields of Lens and the German positions around Arras. In spite of bad fortune in weather at the beginning of the day, so bad that there was no visibility for the airmen, and our men had to struggle forward in a heavy rainstorm, the first attacks have been successful. Russia: widespread popular opposition to the war causes the Petrograd Soviet to repudiate annexationist ambitions. 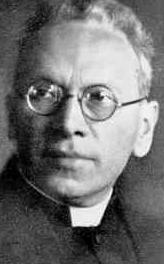 As a member of the Confessional Church, Bobrowski had contact to the Christian resistance against National Socialism. He was a lance corporal for the entire Second World War in Poland, France and the Soviet Union. In 1943 he married Johanna Buddrus. 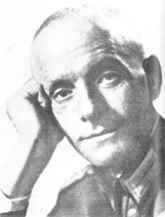 From 1945-1949 Bobrowski was imprisoned by the Soviet Union, where he spent time working in a coal mine. In winter the low-lying area of the Lys river-valley was to a large extent flooded, and in spring it was often nothing but a marsh for weeks on end - a real horror for the troops holding the trenches at this point. North of the Lys the ground gradually rose, and then mounted sharply to the great group of hills which had its mighty pillars at Kemmel and Cassel. It was perfectly hopeless to think of carrying out such an attack before the valley of the Lys was to some extent passable. In normal circumstances of weather, we could only expect the ground to become dry enough by the middle of April. But we thought we could not wait until then to begin the decisive conflict in the West. We had to keep the prospects of American intervention steadily before our eyes. Notwithstanding these objections to the attack, we had the scheme worked out, at any rate in theory. Latvia proclaims its independence from Russia. 1934 Austria bans dissemination of Pan-German Association propaganda. 1937 The Kamikaze (Mitsubishi Ki-15) [not having the later suicide connotation but] the first Japanese-built aircraft to fly to Europe, arrives at Croydon Airport in London. The flight from Tokyo to London took 51 hours, 17 minutes and 23 seconds and was piloted by Masaaki Iinuma, with Kenji Tsukagoshi serving as navigator. The arrival of the Kamikaze caused a sensation in the Western world. Several years earlier, a prize had been offered for the first flight between Paris and Tokyo within less than 100 hours. Many European aviators had failed at this challenge, and one year before the flight of the Kamikaze, a French pilot attempting the challenge was killed when his aircraft crashed into a mountain on Kyushu. Racism was still very prevalent in the West in 1937, and the Japanese achievement thus stunned many observers who believed that the Japanese people did not have adequate vision for the purposes of flying aircraft. Some observers even speculated that Masaaki Iinuma could not be genuinely Japanese, but was of mixed, partially Mediterranean descent. Operation Weseruebung was the code name for Nazi Germany's assault on Denmark and Norway during the Second World War and the opening operation of the Norwegian Campaign. The name comes from the German for Operation Weser-Exercise (Unternehmen Weseruebung), the Weser being a German river. In the early morning of 9 April 1940—Wesertag ("Weser Day")—Germany invaded Denmark and Norway, ostensibly as a preventive manoeuvre against a planned, and openly discussed, Franco-British occupation of both these countries. After the invasions, envoys of the Germans informed the governments of Denmark and Norway that the Wehrmacht had come to protect the countries' neutrality against Franco-British aggression. 1941 World War II: Yugoslavia: Armies are crushed by German Blitzkrieg. 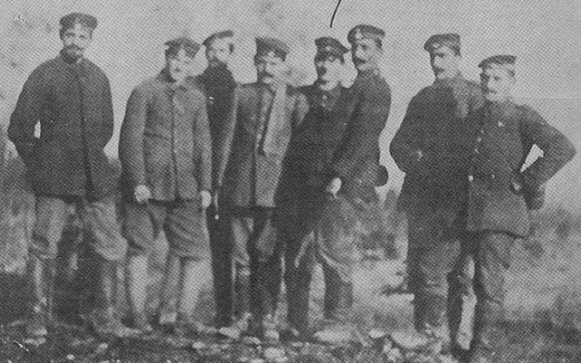 German troops enter Salonika. 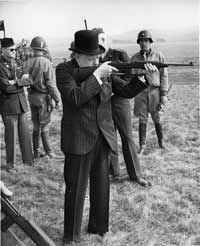 In a speech, Winston Churchill justifies the necessity of answering Greece's appeal for help, calls to America for increased help, saying that main battle is that of the Atlantic. 1942 World War II: Battle of Bataan: American and Philippine defenders on Bataan capitulate to Japanese forces. The surrender is followed by the notorious Bataan Death March, which will claim nearly 10,000 lives. Japanese Navy launches air raid on Trincomalee in Ceylon (Sri Lanka); Royal Navy aircraft carrier HMS Hermes and Royal Australian Navy Destroyer HMAS Vampire are sunk off the country's East Coast. Death: Evgeniya Rudneva: Russian World War II heroine. She flew 645 night combat missions on the old and slow Polikarpov Po-2 biplane, destroying river crossings, troop trains, troops and military equipment of the enemy. She perished valiantly while flying her 645th combat mission near the village of Bulganak, to the north of Kerch. She was shot down by Flak along with her pilot Panna Prokofyeva. In her letter to professor Sergei N. Blazhko, head of the Astrometry Department of Moscow State University, dated October 19, 1942, she wrote that her first bomb she promised the Nazis for the building of the Faculty of mechanics and mathematics, which was bombed by them in the winter. She wrote that she was defending the honor of the university. 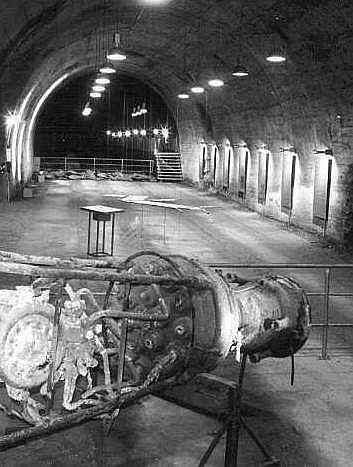 Nordhausen and Dora-Mittelbau: (Dora-Nordhausen), where thousands of slave laborers have already died in the underground V-2 plants, is liberated by the Americans. Resistance: Admiral Wilhelm Canaris, former head of the Abwehr, Hans Oster (above, right), and Pastor Dietrich Bonhoeffer are hanged at Flossenbuerg concentration camp. Note: Dohnanyi is killed at the Sachsenhausen Camp, one of four members of Bonhoeffer's immediate family to die at the hands of the Nazi regime for their participation in the small Protestant resistance movement: Two sons (Dietrich and Klaus) and two sons-in-law (Hans von Dohnanyi and Raediger Schleicher). 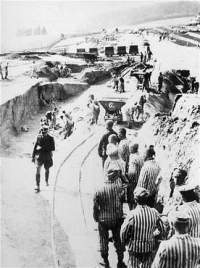 Mauthausen: The Germans begin evacuating Mauthausen concentration camp. 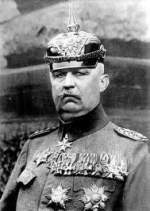 Battle of Koenigsberg—in East Prussia—ends. Battle of Berlin: The Red Army is repulsed at the Seelow Heights on the outskirts of Berlin. 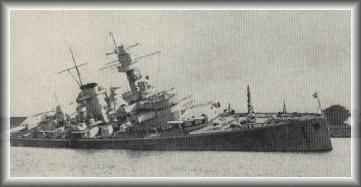 War at Sea: The German pocket battleship Admiral Scheer is sunk. Major Jones: As Reich Chancellor you were responsible for distributing the largess of the Nazis among yourselves, were you not? Lammers: I was in charge of the Fuehrer's funds; and on his instructions I made the necessary payments out of those funds. I could not spend money as I pleased. 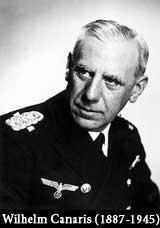 Major Jones: You, as Reich Chancellor, delivered a million Reichsmark to Dr. Ley, did you not? Lammers: That was a donation that the Fuehrer specifically granted to Ley. I did not do that on my own initiative. Major Jones: And Ribbentrop was another recipient of a million, was he not? Lammers: He received a million in installments, first one half and then the other. Major Jones: And Keitel was another millionaire, was he not? He received a million, did he not? 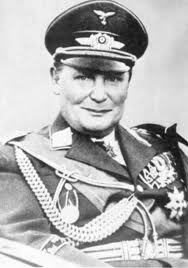 Lammers: He received a sum of money and an estate, because the Fuehrer renewed the practice of the old Prussian kings of granting land and money to his generals. Major Jones: And you yourself received 600,000 marks, did you not? Lammers: I received 600,000 marks on my 65th birthday. I received this sum because I had never received anything in my previous positions, since I had never asked for it—also because I had twice been bombed out and had no house or property of my own. The Fuehrer wished me to buy a small house. Major Jones: That is all. 1959 Wunderwaffen: NASA selects the USA's first astronauts, "the Mercury Seven." 1966 A statue of Winston Churchill is dedicated at the British Embassy in Washington DC. Please note that the list-owner and the moderator are not responsible for, and do not necessarily approve of, the random ads placed on our pages by our web server. They are the unfortunate price one pays for a 'free' website.